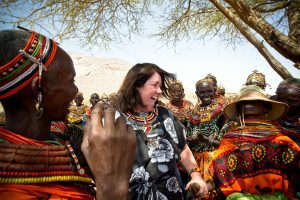 Over the past twelve years, I have had the tremendous blessing of working to build an organization and community that has contributed to the prosperity and dignity of more than 116,000 women and children in northern Kenya. The experience of founding and leading The BOMA Project, along with my co-founder, Kura Omar, has been a consuming, mesmerizing and sometimes sobering experience. I’ve had days when I have gone from furiously outraged to deeply saddened to humbly apologetic. My days in the field with our staff and the women we work with were nothing but electrifying. Two years ago, I went to the BOMA Board of Directors to ask that we establish a course of succession in order to identify the next new leader of BOMA. The Board got to work, establishing a transition committee to oversee a selection process for when it would be needed. And our team got to work to build a solid foundation upon which my successor could continue to scale BOMA’s innovative poverty graduation program for women in the arid lands of Africa. During this time, we built a solid management team and strengthened our finances and infrastructure. We added new team members, mostly in Kenya, and BOMA now has a committed staff of over 140 people spread across four regional offices in Kenya and a small fundraising, communications and finance office in the US. We’ve established healthy partnerships in Africa with outstanding organizations like Mercy Corps, ACDI/VOCA and Catholic Relief Services and we are working closely with the Government of Kenya and other partners to build a viable social protection program for the country’s most vulnerable citizens. With a new robust Strategic Plan in place, approved by the Board of Directors in November 2017, we also have an established blueprint for how we will reach our next audacious goal of reaching one million women and children by 2022. With all of these foundations in place, I am pleased to announce that John Stephens, a BOMA board member who has served as the Interim Executive Director of BOMA during my summer sabbatical, has been approved by the Board of Directors as the new Executive Director of BOMA. In addition to BOMA board service, John is an experienced development professional with over 10 years at Mercy Corps in a variety of emergency relief and development roles in South Asia and West Africa and as director of programs in China. John also brings a funder perspective from his time at Vibrant Village Foundation, where he directed grant-making to over 40 nonprofits in 25 countries. With John at the helm of BOMA, I will transition to the role of Founder and Advisor and will provide support to the organization, and specifically to John, over the next year. I will also continue to serve on the BOMA Board of Directors. I want to assure everyone that BOMA’s commitment to our founding principles of local leadership, community consultation and rigorous evaluation strategies are as strong as ever. We will continue to lead in innovations, particularly through the use of technology, in order to ensure high-quality program delivery and increased transparency in humanitarian operations globally. I am deeply grateful to everyone who has supported BOMA over the years. Your investment of time and resources into our work gave me the confidence to give a voice to the voiceless, the marginalized and the forgotten. Africa is more than slums and farmers, and I will continue to work to highlight the unique challenges that residents face in the Arid Lands–over 40% of the African continent. I also want to assure you that our goals are achievable under John’s courageous leadership. Like every staff member at BOMA, John and I share a vision where development programs are delivered in ways that amplify the resilience and dignity of every person we touch. Thank you for your continued support of that shared vision and I hope you will join me in giving John Stephens a very warm welcome to the BOMA community.